Image (L-R): Jeremy Hanson, Daniel Radford, Allen Chapman and Adam Garner. 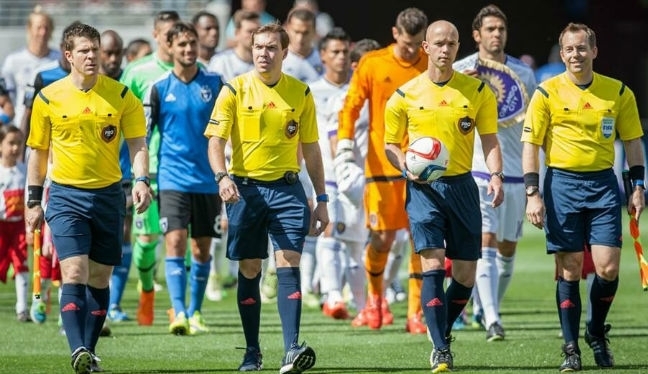 San Jose played in front of what is likely to be their biggest home crowd of the season, in their annual outing at Levi’s Stadium, and PRO’s Jeremy Hanson has shared his experiences after officiating the game. Once a year the Earthquakes make the trip to the home of NFL franchise San Francisco 49ers, with 36,224 fans showing up for their 1-1 game against Orlando City in MLS on May 24. While it was down on 2014’s attendance at the stadium – the first of a multi-year contract which saw a 1-0 victory over Seattle Sounders – the figure was still double a sell-out crowd at their Avaya Stadium home. And assistant referee Hanson admits a crowd of that size presents different challenges to other assignments. “My first impression of the stadium was its size – it is pretty much a stadium stacked on top of a stadium, with two giant scoreboards at either end,” Hanson told proreferees.com. “Everything seemed bigger, from the locker room to the pitch itself. You definitely feel very small down there on the pitch. “Sometimes in stadiums that are large like Levi’s, the sight lines for myself and the other assistant referees can be a little off. It just requires a bit more work before the match to make sure we are staying square to the field and keeping the right lines. For 38-year-old Hanson, the assignment alongside center referee Allen Chapman, fellow AR Adam Garner and fourth official Daniel Radford was another step in what he is targeting as a landmark season. The Earthquakes versus Orlando game was one of Hanson’s more eventful outings in 2015, in what is his fourth year in MLS. As a middle school teacher and a father-of-four, there are plenty of daily challenges in Hanson’s life away from soccer, but having the big-stadium experiences on the field is something he’s hoping will help advance his progression within PRO. “I have worked in CenturyLink Field up in Seattle as well as RFK in D.C. I also had the privilege to work the final sporting event in Candlestick Park last summer when San Jose played host to Atletico Madrid. These big stadiums always help for new experiences and improving my skills.